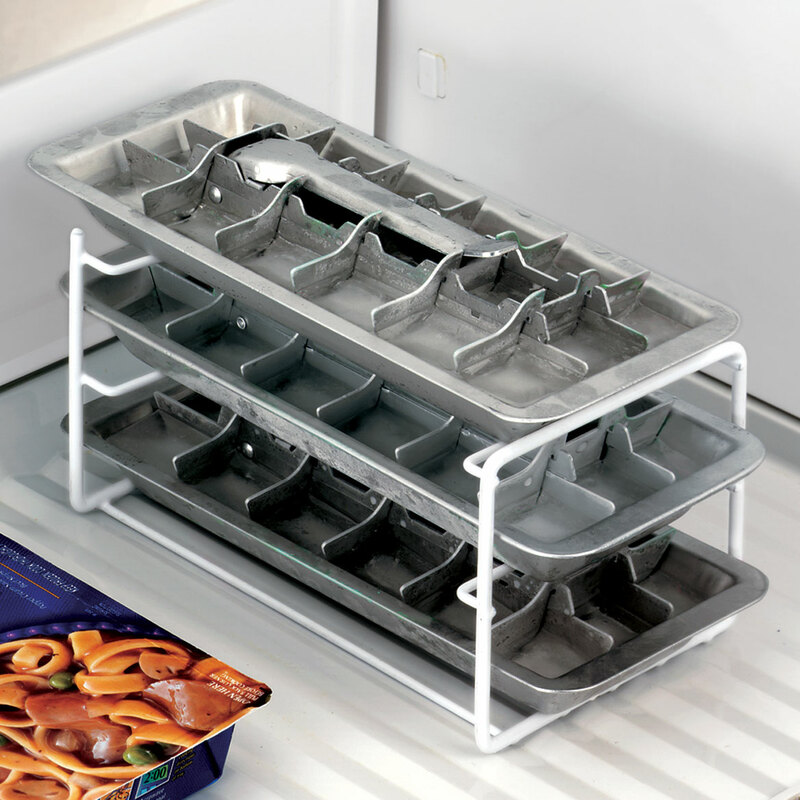 This rack prevents ice cube trays from sticking to each other. Each level is too far apart. If they were closer, there would be room for frozen food on top. Perfect for the pantry a real space saver! This does exactly what it is supposed to do, organize and saves space in your pantry or cabinet. I plan on ordering 3-4 more, it is just what I needed. If you are like me and have tons of different kitchen wraps then this is for you. I am a baker always making sweet treats for others, constantly wrapping up food to go, so glad I can have room in the kitchen pantry for these items! Could not fine it in the stores. Found it here for the best price and the perfect size. Fits great in our RV refrigerator. I wanted to order this when I ordered the trays but it was out of stock. I was happy to see that you had the item again! Great product. It's just the right size for any ice cube trays. It's exactly what I expected and holds all my wrapping products neatly where I can access them more easily. I looked at the wraps and bags for so long hoping to find a solution. Well, it took three of them, but my pantry is organized finally. Have better organization of my wraps and I love it. I use this product daily! I purchased this product for my pantry. It's great having all my boxes of storage bags and food wrap in one spot. It fits perfectly and helps the pantry look a lot neater and it also saves on a lot of room without having so many boxes floating around. It does exactly what it says. this is great for freezer to stack ice trays on it give me more room to keep other things. I have 3 of these and they are very useful in keeping your pantry organized with rolls of foil or saran wrap, and even boxes of zip lock bags such as sandwich or snack bags. I have used small white cable ties and have them linked together for very long rolls of aluminum foil. Put two of them together lengthwise and cable tie. Works great! My wife liked it so much, that you asked me to purchase an additional one. I purchased two of these to use for foil rolls, storage bags,etc. They work very well for me. My pantry looks so much neater! I just wanted to "neaten" up the pantry and make finding each wrap easy and quick. Problem solved with this product. Thank you. This item is so simple, yet practical and such a space saver. 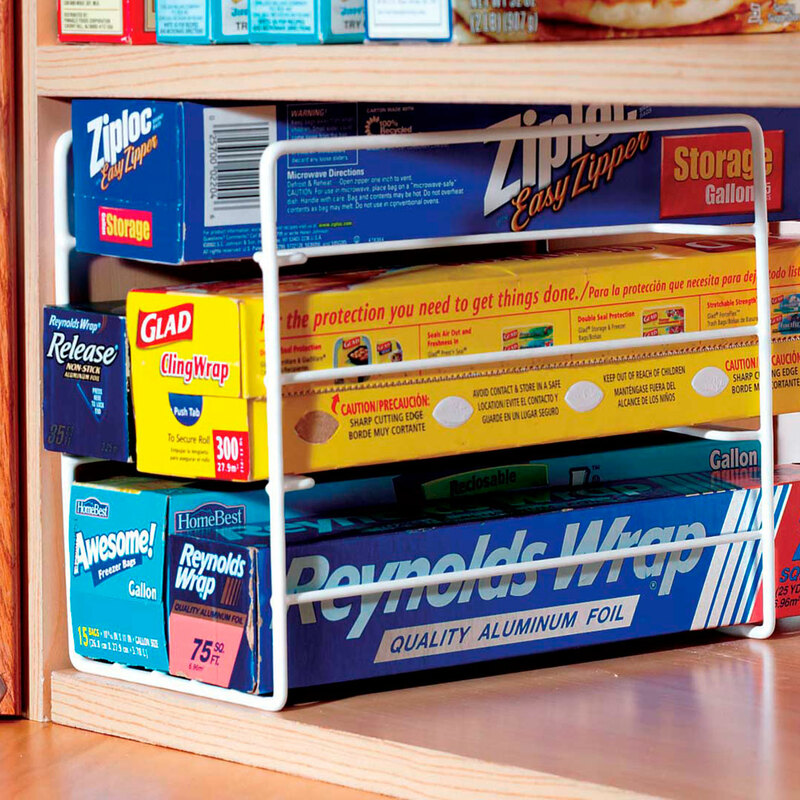 Keeps all those wrap boxes neat, visable and ezly accessible on your kitchen shelf--esp. if you have a narrow one like I do. My mom bought one for me and one for herself years ago when I got my 1st apt. I've moved it w/me 3x and love it! Recently, a neighbor saw it and wanted one. I searched everywhere and could never find one again 'til I saw it in the Walter Drake catalog. My only issue is not about the product. It was reasonably priced, but WD not only charged S&H, but an extra $1.99 "processing fee". So, that doubled the total cost of the item, which is stupid. Processing fee? Really? Isn't that part of the S&H? Normally, I wouldn't have patronized WD as a result of the add'l fee, but I really wanted to get it for my neighbor so I caved and bought it anyway! She is happy, so that is worth it, but shame on WD! My pantry is very small and I can stack wax paper, storage bags, foil and others. It allows more room for can goods. A Real Space Saver would buy again! It truly ie a space saver and organizer. Works perfectly to hold my ice trays in the freezer. Works perfectly to hold my ice trays in freezer. It works as it should, but it came with both side rails bent. I bent them back into postion, it's all good now. I just hope this wasn't the norm for this company. If the item is damaged then they shouldn't ship it. Other then that, it works fine. All my kitchen paper products, ie tin foil, plastic wrap all organized. This product was right in the nick of time. My wife had just moved all the boxes of Saran Wrap,waxed paper etc out of the drawer she kept them in and them piled on a cabinet just as they are pictured in the catalog. Only she had accumulated doubles of most of them.We ordered two stackers and stacked them.We fastened them together with electrical wire ties,Works great. My wife was very pleased. I could only find this item in your catalog. I wish it was made with more space between the bars to handle deeper boxes. Just what I wanted to organize my food storage boxes. Great space saver! I have mobility problems so bending to retrieve wraps out of the cabinet was a problem - I needed to keep my wraps on the counter. I was initially disappointed because the stacker didn't hold the wraps in place when one was removed. HERE'S HOW I FIXED IT: I had several long twist-ties I'd saved from assorted items that were attached to cardboard backing. I used these in a zig-zag fashion to bridge the gaps in the top and middle sections. Now everything stays put when I need to pull out one box. This product keeps my foil,plastic wrap,sandwich bags,etc well organized. Before I purchased it my things were always falling off the shelf into the back of the cabinet. The cabinet is a corner one with the lazy susan shelves. I was always on my knees reaching into the back of the cabinet retrieving my things. This stacker solved my problem. My food wrap boxes were hard to get to until I got this food wrap holder. It makes them easily accessible. I use it to help stack ice trays in the freezer, works great and keeps people from knocking the trays over. no assembly easy to use, doesn't get much better than that. Would hold the boxes of aluminum foils, wax paper, etc. better if the shelving went totally across instead of only part way. Design allows boxes to fall in between to the lower shelf when pulling out one box. Usable, but simple design change needed. The soace between the shelves is too small for some of the paper boxes used. This is a hard to find item and though it is not exactly what I wanted it will work. Boxes of wrap don't stay stacked because the wire does not go all the way across each section. Bought to hold metal ice cube trays...doesn't work for that. To wide for the trays. The construction needs to be stronger. It needs to be wider to actually hold 6 boxes regular size boxes. This would not fit in my cupboards. It took up more room than it saved. Am going to return it. The wire shelves that are supposed to hold the wrap boxes on the top two levels are too narrow to hold most standard size boxes. This leaves a big gap between them. The boxes fell off each shelf and through the gap instead of sitting on them. I solved the problem by attaching three strips of heavey duty tape from one shelf across to the other filling in the gap and giving the boxes something to sit on. It works fine now that I've fixed it but whoever makes this organizer needs to make the shelves wider with little or no gap between them or just eliminate the two separate shelves altogether and use one large flat shelf. The customer should not have to jerryrig a product just to make it work as advertised. Wouldn't fit in my kitchen cupboard.odd dimensions. Didn't fit the boxes.top heavy. wish i would have seen how it was designed. boxes fit too tightly. need two hands to take boxes out. one hand to hold one box in place while taking one out. when you take one box out the other falls through the center. a big waste. Doesn't measure up to the description. The kitchen wrap stackers were almost too big and bulky for my kitchen cabinets. I got them to stack my waxed paper, aluminum foil and plastic wrap boxes. They don't fit onto the kitchen wrap stackers very well and only will hold one or two boxes at a time. I can't get to them on the stackers to use. I bought two stackers because I don't have enough room for all the boxes, but I don't have room for the stackers either. They have been a waste of money and time, and I'm sorry I bought them. I won't make that mistake again. The item doesn't accommodate six boxes of kitchen wrap, foil, etc. The boxes get stuck and/or fall through the slots. It is not sturdy and falls over quite easily. I purchased 2 of these contraptions that cost me $13.98 +. Returning the warp stackers cost me some $11.35. Not a wise decision to buy. Does not work very well for ordinary boxes of wrap or bags. Too small to hold 6 packages. I use this item in the bottom kitchen cabinet. It doesn't work for me. When I take one box out, the other one falls in the center. VERY FRUSTRATING! I need to hold one box to to get the other one from being pushed back and falling out. Probably good for wider boxes--single box for each rack--3 boxes instead of 6. The wrap boxes will not stay in the different compartments. I am very disappointed in this item. Not what it looks like for sure. I could really use the space. I already have one but it fits perfectly in my pantry and I need another one for the pantry and one for the cabinet in the kitchen for my sandwich and snack baggies. These are the best I've found anywhere!!! Will use in the freezer when having parties, this will hold extra ice cube trays. Organize, Organize! Keep life simple. This really good as described for either rolls and/or the freezer. I NEED ORGANIZATION TO MY SHELF. "needed for space and I wanted it "
searching for this item to no avail. happened on this in your catalog. perfect for pantry organization. I need to use space extremely efficiently in my kitchen, which is tiny. This looks like it will help. Want to try to expand my freezer capacity. This looks like it might be good for bags and meals to do that. Otherwise I can always use it in my pantry. Helped organize my plastic bags in cabinet. 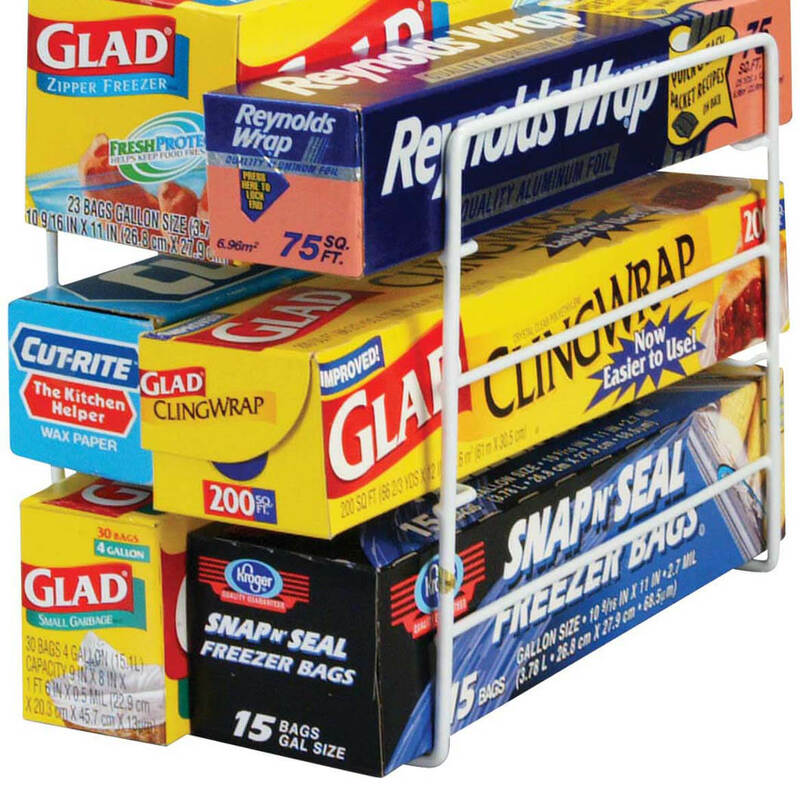 These work very well in the pantry to keep long rolls of foil or saran wrap organized. I have several of them and cable tie them together to keep them more rigid and upright. Works great! need the space in cabinet! Have a perfect place in cabinet, Pain having them takee up so much cabonet draw space. Organize and keep every thing handy. This is wonderful for both wraps and the feezer. I am hoping that this will keep my husband from putting the foil and wax paper in different areas where I can not find them. This is perfect! I have them in drawers now, and they take up too much room. To organize cabinet where I keep my wraps . I have a very small kitchen in my apartment and need extra storage. This seems to fit my needs. Fills an immediate need. Have seen one at friend's house and looks like a perfect fit. I changed my mind and want to take the item off the order form which has not been finalized ? I need to cancel the item I put in my shopping basket because t changed my mind about purchasing it. I am hoping that someone can tell ne how to cancel the order ? BEST ANSWER: Thank you for your question. We would recommend not stacking the organizers. We hope this information will be of help to you. what are the dimensions in width, height & depth? BEST ANSWER: Thank you for your question. The dimensions are 9.5" high by 8 inches wide by 5.25" deep. We hope this information will be of help to you.